I don't wish to suggest that the cyclist above is a recent immigrant. She is probably born and raised here and can speak better Danish than me. The photo is for illustration only. Immigrants from an OECD country who move to Denmark face cultural and linguistic challenges, just as they would moving anywhere else. An Australian or a Spaniard moving here will have to adjust to the mentality of the Danes and try to learn the unintelligible language. For immigrants from other regions the challenges are often greater due to vastly diffent cultural norms. While an Australian or a Spaniard, as a rule, have probably learned to ride a bicycle in their childhood, many new arrivals from Arab countries or Africa have not. We've had many bicycle courses for immigrants over the years and learning to ride a bicycle is a great way to integrate in Danish society. You'll get up close and personal with your new fellow citizens on the bike lanes but you'll also be given the freedom of movement that is so important. Busses and trains serve a great purpose, but signage and timetables are a hurdle to overcome as well. Riding a bike around lets you discover your town or city and increases your mobility. 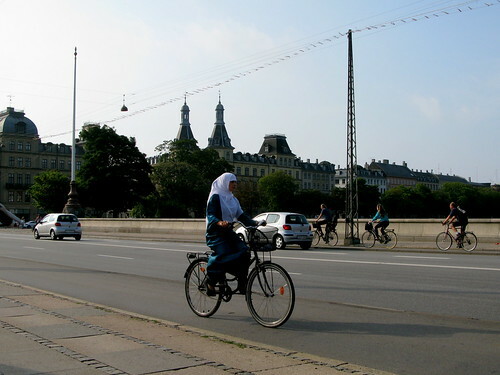 Aalborg County has enjoyed success with their bicycle courses for immigrants. - "I would like to learn to ride a bicycle so I can ride around with my children". - "I would like to learn to ride a bicycle so I can ride to work". - "I would like to learn to ride a bicycle because it's healthy and because I can save money on bus fares". These are some of the explanations from 12 female immigrants as to why they took part in the bicycle course offered by Aalborg County in Northern Denmark. "In our experience, many adults have a hard time learning to balance on a bike when they get on one for the first time. Fortunately, all of our participants learn it and then it's a question of just continuing their training", explains Helene Holm, Jane Broen Jensen and Bewag Ahmad, project leaders at a refugee project at the Family and Employment Department in Aalborg. Apart from the art of balancing, learning to cycle is all about learning the traffic regulations. Aalborg County works with the Aalborg Police on this angle. Policeman Bjarne Maeng Pedersen says, "It's a great intiative that will mean a lot for integration. These women will be role models for their daughters and other young girls in their neighbourhood. We often see that it is only boys who are allowed to learn to ride a bicycle. But the bicycle course may help many immigrant girls to learn it, too." "Self-confidence among the participants grows when they experience that they can learn to ride quickly. This self-confidence gives them loads of energy and courage to learn new things in general", explains Helene Holm. Apart from self-confidence, the bicycle courses can also be the key to getting a new job for the cycling immigrants. Many jobs require that they start earlier than the busses run, like cleaning jobs. That means they either need a driving licence or a bicycle. Many of the partipants look forward to riding a bicycle because they want to live healthier, lose weight and enjoy a greater freedom of mobility in their local environment. During the summer of 2008, 12 cyclist graduates rolled out into the traffic. The next course will take place in the autumn. Aalborg County have no doubts about the initiative. The bicycle courses are a success that strengthen the immigrant women's integration in their new land. Aalborg County's press release, in Danish, with contact information.